Whatever Happened to the Mercury 7 Astronauts? On April 9th, 1959, NASA announced its first seven astronauts, later dubbed the “Mercury Seven”. What ever happened to the Mercury 7 astronauts? These were the first of NASA’s astronaut corps who paved the way for the later Gemini and Apollo missions.We knew all their names! The movie, The Right Stuff, adapted from Tom Wolfe’s book of the same name, dramatized their lives and their achievements. What ever happened to the Mercury 7 astronauts? These were the first of NASA’s astronaut corps who paved the way for the later Gemini and Apollo missions. The first American in space, he made a 15-minute suborbital flight May 5, 1961 (three weeks after Cosmonaut Yuri Gagarin became the first man in space). He later returned to space as Commander of Apollo 14 in 1971. He used a lunar sample scoop with an attached golf-club head to hit a ball on the Moon. he retired from NASA in 1974 and went into private business in Houston. In 1994, he published a book with two journalists, Jay Barbree and Howard Benedict, called Moon Shot: The Inside Story of America’s Race to the Moon. Fellow Mercury astronaut Deke Slayton is also named as an author. The book generated some controversy for use of a staged photo purportedly showing Shepard hitting a golf ball on the Moon. The book was also turned into a TV miniseries in 1994. Died from leukemia in 1998 at age 74. He was the second American to orbit the Earth on May 24, 1962. He gave the famous send off — “Godspeed, John Glenn” when Glenn was being fired into orbit. He later became involved in the Navy’s SEALAB program, and spent 30 days under the ocean in 1965. He retired from the the Navy in 1969, after which he founded Sea Sciences, Inc., a corporation for developing programs for utilizing ocean resources and improving environmental health. Age: 87. The first American to orbit the Earth on February 20, 1962, circling three times in 5 hours. He was a fighter pilot in World War II and in the Korean War and became a test pilot before joining NASA in 1959. He left NASA in 1965 and retired from the Marine Corps the next year. He later became a Democratic U.S. senator from Ohio and ran briefly for president in 1984. He has the distinction of returning to space in 1998 for a nine-day mission aboard space shuttle Discovery, becoming at the then age of 77, the oldest person in space. Turned 91 in July, 2012. 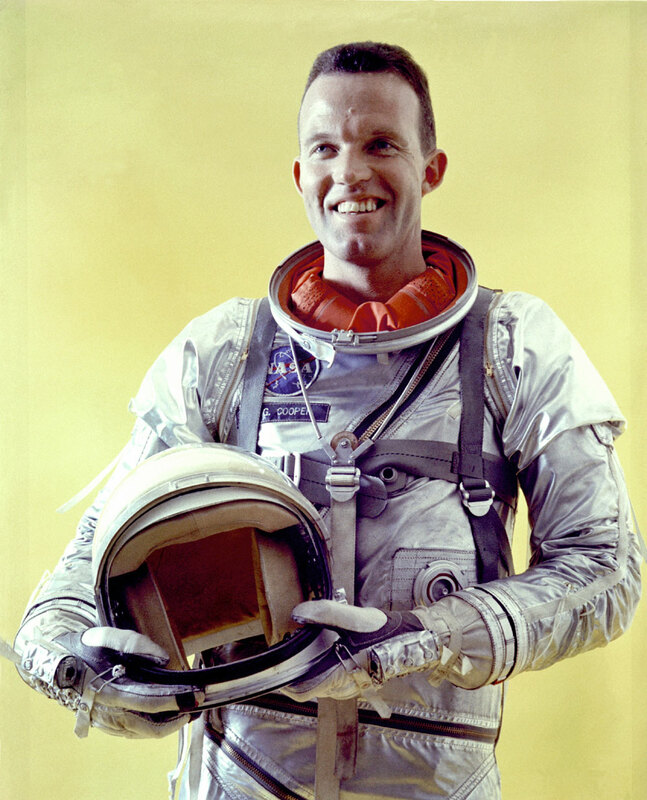 He piloted the longest and final Mercury spaceflight in 1963. He was the first American to sleep in space during that 34-hour mission and was the last American to be launched alone to conduct an entirely solo orbital mission. 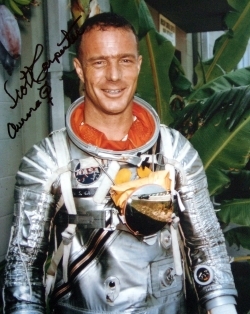 In 1965, Cooper flew as command pilot of Gemini 5. Cooper was selected as backup commander for Apollo 10 and hoped for an assignment as Commander of Apollo 13. However, after a falling-out with NASA management, Alan Shepard was chosen instead (Shepard’s crew was later moved onto Apollo 14 and the Apollo 13 command went to Jim Lovell). Having flown 222 hours in space, Cooper retired from NASA and the Air Force on July 31, 1970 as a colonel. After leaving NASA, Cooper served on several corporate boards and as technical consultant for more than a dozen companies in fields ranging from high performance boat design to energy, construction and aircraft design. During the 1970s, he worked for The Walt Disney Company as a vice-president of research and development for Epcot. Cooper developed Parkinson’s disease late in life. At age 77, he died from heart failure on October 4, 2004. His death occurred on the 47th anniversary of the Sputnik 1 launch and the same day SpaceShipOne made its second official qualifying flight, winning the Ansari X-Prize. What is The Future for The Space Travel? It’s a series Chris.. watch the ones to come. These were the first of NASA’s astronaut corps who paved the way. Have A Very Hubble Holiday!